Nevisian cultural advocate Mr. Halstead “Sooty” Byron has been earmarked to coordinate the various steps during construction of the Nevis Performing Arts and Cultural Centre when work on the multi million dollar facility commences at Pinneys Estate later this year. The disclosure was made by Minister of Culture Hon. Hensley Daniel on Thursday moments after he received the design and bid documents from the St. Maarten based architectural firm of IXI Design N.V. He said over the years Mr. Byron, like others who had a stake in the island’s culture, had treated the need for a performing arts facility with urgency. “For those of us who have an interest in culture, for those of us who connect culture with our economic development, connect culture with our social development and those of us who have wanted some place for a long, long time for the performing arts, I think that, that [Nevis Performing Arts and Cultural Centre] should give some fillip to our artists and all persons involved in creative arts. 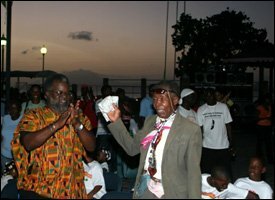 “I think Mr. Byron, having been Nevis’ first Director of Culture and previous to that engaged in a various range of cultural activities as a story teller and as a poet, I think it is only fitting that he be the person responsible for ensuring that this happens, since as Special Advisor in the Ministry of Culture, Chairman of the Nevis Development Cultural Foundation, Chairman of the Culturama Committee that he has a specific interest and certainly he views this with some level of urgency,” he said. Notwithstanding, Mr. Byron expressed his satisfaction that the project had finally entered another stage and that the construction stage was another step closer. He used the opportunity to compliment other local performing arts enthusiasts who he explained had given invaluable assistance during the design stage of the facility. “I want to pay tribute and to say special thanks to some local experts in the arts who were able to give very invaluable advice and expertise to Mr. Baker as he went through the drawings and he came back and forth. “Ms. Esther Brooks, Mr. Amba Trott as well and Mr. Lloyd Hezekiah, those were three persons who played a very integral part in providing advice and expertise as persons who have been involved in the arts both in and outside of Nevis. They have all contributed to the work that Mr. Baker and IXI Design did in completing this stage of the project so far,” he said. The project which was redesigned by the sitting Nevis Island Administration when it took office over two years, to provide for a conference facility with two conference rooms with a seating capacity of 100 each. It is funded by the Taiwanese Government through a US$1million grant and a US$2million loan. The facility will cover a total of 18,000 sq. feet.